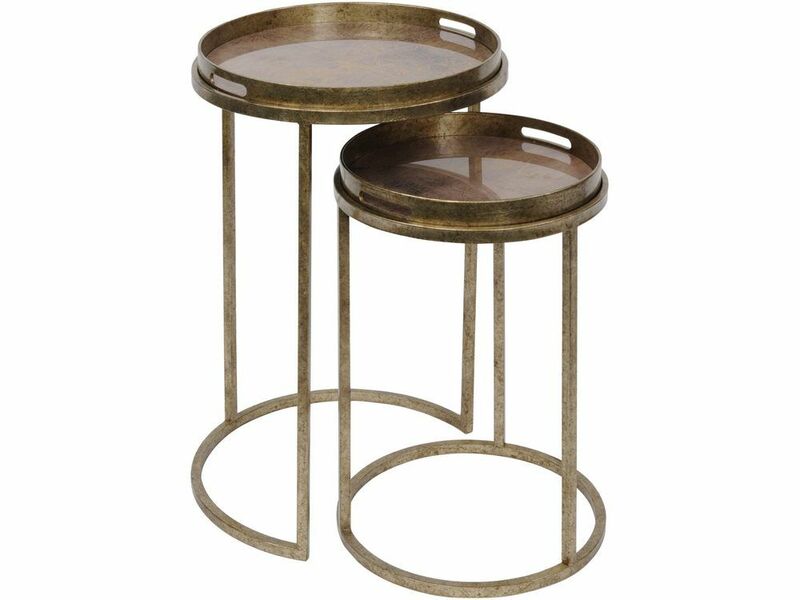 These round nesting tables will add worldly elegance to any setting with their aged gold rims and faded map designs set into their tops. The dark gold, mottled hue of the metal tables gives a characterful antique look, enhanced by the rudimentary world maps depicted in gold outline and encapsulated beneath glass, giving them a subtle shine. The cut-out handles in the tables hint at another use - the tabletops lift off to become handy serving trays, meaning these nesting tables are ideal to work a room' and then become part of the decor. With the larger table having an open edge to its circular design, the smaller can neatly stow away when not in use - you can present them as stepped display platforms as pictured, or space them around a room to create a characterful theme. The map print nesting tables are the height of practicality and style, whether you use them for serving drinks and nibbles, or as elegant display surfaces for plants, lamps and ornaments.